If South Africa has one iconic wine that is recognised the world over, it is the sweet Constantia. Three hundred years ago the Muscat-based dessert wines of the Constantia region, just on the southern outskirts of modern-day Cape town, were already treasured around the world: in The Mystery of Edwin Drood, Charles Dickens wrote of “The support embodied in a glass of Constantia,” while in Jane Austen’s Sense and Sensibility, Mrs Jennings recommends Constantia for “Its healing powers on a disappointed heart.” The most famous fan of Constantia was said to be Napoleon, who had regular shipments sent to him during his period of exile on St Helena. The 300-year history of the wine was not uninterrupted however. Changes to export tarrifs in the 19th century made life difficult for producers and production decreased dramatically, before the scourge of Phylloxera sounded the death knell for sweet Constantia later that century and production ceased. Fast forward to the 1980s, and the new owners of the Klein Constantia estate – part of Simon van der Stel’s original estate planted when settlers first arrived in South Africa – determined to recreate this historic wine. 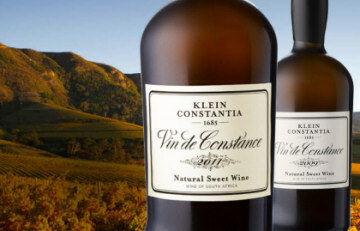 They studied early records to determine the ‘recipe’ for sweet Constantia and a careful selection of vines was identified which “In all likelihood came from the original stock used in Constantia 300 years ago.” In 1986 Vin de Constance was reborn, replicating the original as closely as possible, even down to the antique-style bottle from the 18th century. I recently had the chance to attend a superb vertical tasting of 10 of the modern-day wines, starting with the 1987, running through to the most recent 2012 edition. The style changed subtly from vintage to vintage (and given that the age of the wines spanned more than 20 years), as weather conditions altered the ripening and length of the season: Vin de Constance is not botrytised, but is made from a selection of very late harvested Muscat de Frontignan grapes, the pickers sometimes passing through the vineyard up to 25 times to pick only the most shrivelled and sweet berries. Bottled in 50cl bottles after ageing in oak (and sometimes acacia) casks, Vin de Constance has considerable cellaring potential as proved by the oldest examples here. In terms of replicating a legend, Klein Constantia has done very well blending classic with modern in these luscious and complex, but fresh and pure wines. (2016) Wonderful lifted aromas, in a blend of honey and raisins in this wine from only the second vintage made in the modern era. The palate has delicate toffee and such pure sweetness, then a mocha touch of richness comes through. So long, gently nutty but always sweet. Superb. This had less than 80g/l of residual sugar, whereas today the wine typically will have 160g/l or more. Not available retail. (2016) Slightly more sherried and gently oxidised than the 1987, with currants and raisins and such lovely orange rind fullness and grippy acids. Really searing and long acid finish gives this fabulous balance and clarity. Not available retail. (2016) Fruitier than the 1992, with fig and orange, and a caramel tone. The palate has a beautiful purity, a seamless and long finish, the lemon acidity beautifully pitched against 168g/l of residual sugar. (2016) A nice caramel and Botrytis-like barley sugar and lightly earthy note. Quite different on the palate to the previous wines. Lots of fruit purity, a coffee ground depth of oak, though I find the acidity a little more angular. Long and tantalising, but not quite the harmony of the best here. 135g/l of residual sugar. (2016) Light golden toffee colour with such a clear, fruit and glacé orange nose, the gentle tobacco and toast, then a limpid, shimmering palate. Retains so much honey and limpidity into a long glorious finish. With 130g/l I find this the most elegant vintage so far tasted. (2016) A real change of style in this vintage, with barely more than 12% alchol compared to the 14%+ of previous vintages. Toasty, nutty, spices and exotic fruits, then that bright orangey tone into marmalade grip. The palate has interesting herb and toast tones to the sweetness, but not the length nor clarity of the 2004. 168g/l residual sugar. (2016) Lovely nose here, the Botrytis touch again I think giving complex rotted orange nuances, lots of honey and nuts. The palate has lovely rich fruit sweetness and a luscious texture. Quite long with a toasty, burnished finish and good balance and length, a very luscious and complete Vin de Constance. 177g/l of residual sugar. (2016) Very high, perfumed, more Muscat character coming through but also a touch of plump juicy sultana. The palate has a striking citrus and mineral acidity that is quite pithy and dry against cappuccino and sweet fruit. Lots going on, a punchy example. 160g/l residual sugar. (2016) Another highly aromatic Constance from the vintage when Klein Constantia announced a style change, trying to introduce a little more freshness into the wine, hence a slightly lower alcohol and slightly lower residual sugar (152g/l). Lots of flowers and exotic incense lift, also lovely orange fruit and a palate layered with toffee and cream, the acidity nicely balanced and with plenty of zest. (2016) A barrel sample. Again following a modern, more aromatic and Muscat style, not so much raisined character, a more pure fruit aroma, all the florals again and even a hint of geranium leaf lift. Full of delicious, cool fruit and a warming, fudge like hint of depth and sweetness. Seems very fine indeed and promises great things.